I find it interesting to see the charged responses I’ve received to this post. It seems some people are far more interested in Doug Copp the man rather than in what he has to say. I’ve made a point of re-reading Doug’s points on the Triangle of Life. I’ve also spoken personally with a number of people who survived extremely dangerous circumstances during the recent Christchurch quake. There is no one set of guidelines that will always keep you safe in an earthquake. Some people happen to be in the wrong place at the wrong time and others get to safety when others nearby don’t. I still think it is wise to read the following guidelines. They do have merit. The mayor of the Far North District here is an engineer and he came back from Christchurch supporting what Doug Copp says about wooden buildings. I’m also inserting a very short extract from my interview with Doug below. See what you think after hearing this. I really do wonder about Duck and Cover. Does it make sense to you? 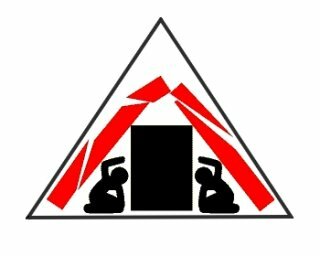 Here are some suggestions from Doug Copp, the world’s disaster survival expert, on surviving a quake using knowledge of the triangle of life. 1) Q: Why is ‘it” called the triangle of life? A: If you look closely at collapsed buildings either in pictures or on TV you will rapidly discover that you see ‘triangular spaces’ formed throughout collapsed structures. It is as natural and normal as gravity or the ‘shape of snowflakes’. They are formed everywhere around objects when buildings collapse. 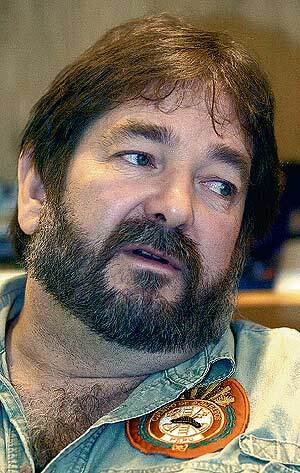 2) Q: Why has it taken Doug Copp 23 years to eliminate Duck and Cover? A: If Galileo could come back from the dead he would ask why some people still believE that the earth is the center of the universe, the world is flat, people should be ‘bled’ to allow demons to escape from the body and man never landed on the moon. As Schopenhauer, the German Philosopher, said: ‘The path of all truth is first to be ridiculed, secondly to be violently opposed and thirdly to be accepted as ‘self evident’. A: 1) Outside in the middle of a field where nothing can fall on top of you. 2) Outside in the middle of the street where falling glass can’t reach you. 3) On a seismic resistant platform such as a boat. 4) On the top floor of a wooden building. 6) In the space between 2 large objects (between twin beds, between 2 cars, between 2 rows of desks). 7) Next to an office bank vault or stack of paper. 10) In front of a hotel lobby counter or bar counter. 11) In front of a sofa. 13) Next to a big bulky object like a piece of machinery, fridge, stove. 15) In the subterranean exterior perimeter of a building. 4) Q: Where are the 14 deadliest places to be in an earthquake? (The places where most dead victims are recovered from; or simply the most lethal). 7) In a brick building less than 10 ft from the outside wall. 8 ) In a doorway of a collapsed building. 9) On the ground floor of any building. 10) Under a carrying beam. 11) Under an object with a high center of gravity that fell over in the earthquake (like a fridge). 12) The middle decks of highway over-passes. 13) Places that catch fire after collapsing. 14) Places with toxins, chemicals and gases that collapse. 5) Q: What is frequency of moment? 6) Q: What do I do in a multi-storey building? A: Be calm; lay down, in a fetal position next to a bed or sofa. When the earthquake has stopped and the building has not collapsed DO NOT MOVE! DO NOT GO TO THE STAIRS! Wait until all the panicked people have fled down the stairs. If the stairs haven’t collapsed under all the combined weight of panicked, fleeing people then you know that they will be safe for you to go on. If you can, then wait for an expert to inspect the stairs before putting weight on them. 7) Q: What do I do in a basement? 8 ) Q: What do I do on a highway? A: Pull your car to the side of the road. Do NOT stop under an overpass or something that can fall on your car. 9) Q: What about the glass windows in a multi-storey building? A: Typically, glass is NOT a problem for the people inside the building. (It is like bursting a blown up paper bag.) The glass blows outward as the air pressure inside of the building increases at the same time as the volume of the space decreases. If you are outside of the building then you should run away from the building into the middle of the street. 10) Q: Where is the deadliest place to be? A: Most dead people are found squashed under a desk. 11) Q: How dangerous is it to search a collapsed building? A: According to OSHA: 60% of ‘rescuers’ are killed going into their first confined space rescue. 12) Q: What are the 10 most important things that I really need in a safety kit? Which are NOT usually found in a emergency kit. A: 1) Chlorine to purify drinking water (usually there is lots of water; however, it is contaminated from sewer lines and water lines leaking and mixing together.). Or O3 Liquid Oxygen purification and energizing and immune system booster drops. 5) A Swiss Army Knife with lots of tools. 7) A hand crank generating radio. 10) Emergen’c’ powered multivitamin and mineral powders. 13) Q: Where is the best place to put an earthquake kit? A: 1) On the roof of your house in a safe box. 3) In a shipping container in the middle of your corporate workplace parking lot. 14) Q: What about books falling on you? A: In 23 years I have never heard of a single individual getting killed by a falling book. 15) Q: What about ceiling fixtures falling on you? A: They typically stay attached to the ceiling and don’t fall away. 16) Q: Who will come to save my family in a major disaster? A: 1) You. You care more for and will do more for your family than anyone else will. In a major disaster the local ‘forces’ are overwhelmed. Do you really expect FEMA to save you? 17) Q: How do people get injured after the earthquake? A: By falling objects. Solution: spend as much time looking up to see what is above you as you do walking over the rubble and looking at your feet. 18) Q: What do I do after a major earthquake stops? A: Get ready for the next aftershock. Get in a safe place and stay safe. Never go back inside of a building until 2 weeks after the initial earthquake. 19) Q: What do rescuers do when a major earthquake occurs? A: 1) Think about their family. 2) Think about their duty to others. 20) Q: What type of structure is immune from earthquake collapse? 21) Q: How come nobody told us to stop going under doorways? A: If somebody who had been telling you to go under doorways actually told you not to do it anymore then they would have to admit that they made a mistake and expose themselves to liability. 22) Q: What happens when schools collapse? 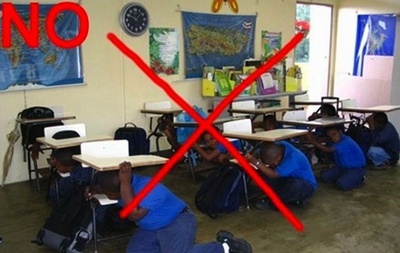 A: The legs snap when the ceiling falls on the desks. The ceiling doesn’t break up because there are so many points of support. The ceiling stays intact and the weight snaps all the legs. You are left with rows of crushed desks and rows of wide open aisles to be safe in and escape to the outside by crawling through. 23) Q: How do I understand what an earthquake is? A: Think of an earthquake as 2 extremely large misshapen and rough edged objects sliding past each other. Sometimes they get ‘hooked’ or caught up together until the forces pulling one object and pushing the other object make them break free. This built up force that is released is the initial earthquake. The forces which continue until the ‘rough’ area has been completely cleared are aftershocks. Remember an earthquake is NOT a single seismic event. It is a period of time—usually less than a month) when you can have hundreds if not thousands of aftershocks. Most of these aftershocks are tiny; however, you can have a larger aftershock than the initial earthquake. Stay outside and safe. Go on vacation. 24) Q: How do I understand the ‘force’ of an earthquake? A: There are many hundreds of elements which determine how much force an earthquake will actually bring to your structure. A smaller magnitude earthquake can cause more damage than a larger magnitude earthquake if the smaller earthquake is closer to you or not as deep. Earthquakes under the ocean have a lot of their energy absorbed by the ocean itself. The type of soil is very important and the underground formations can cause earthquake energy to be amplified or even deflected from your area. I could write a book on this. 26) Q: What about terrorist explosions? A: The survivors are found in survivable voids (triangles of life) on the opposite side of the objects as the blast center. 27) Q: What about collapsed buildings in landslides? 28) Q: What is the most important thing for a ‘rescuer’ to have after a major earthquake? A: Have piece of mind that your family is safe because you told everyone about the triangle of life and the things you learned from this video, power point presentation and manual. This is necessary in order to do your duty to others than your family. 29) Q: What is the most important thing a survivor or rescuer needs immediately before and after a major earthquake? 30) Q: What is the most important thing that you have learned from your experiences at major disasters throughout the world? A: All people look the same when they are squashed under a desk. PLEASE! DON’T ANYBODY TAKE THIS ADVICE UNTIL YOU’VE RESEARCHED WHO THE AUTHOR IS! Do a google search for “Doug Copp” and you will find that NOBODY has anything good to say about Doug Copp, except Doug Copp. He is a self-proclaimed rescue guru with no significant credentials, and almost no followers. DON’T TRUST YOUR LIFE to an e-mail without researching whether the author has any credibility. Thanks for your comment. May I suggest you listen to my interview with Doug and see if you still feel the same way. You start your interview saying Doug exposes the truth about how earthquakes can be survived. Don’t play investigative journalist if you aren’t one. Doug has been exposed as a fraud, making claims that simply aren’t true. I did listen, and all I could hear was his endless self-promotion and the low use of appealing to everybody’s “care for their kids”. He’s a captain in the fire department of Peru? Thanks for your comment. I don’t claim to be an investigative journalist. That role doesn’t interest me. I provide a space for people to tell their stories. It is up to listeners and readers to make up their own minds. I’m not here to judge anyone. There is a spark of light in everyone, often hidden behind the pain. Thanks again. Doug Copp is neither an expert nor an actual rescue worker. As a member of an international disaster response team, Copp is well known in our community as both a fraud and as someone who shows up at disaster sites and gets in the way. He has yet to produce any evidence of the rescues he claims to have performed. And a check of his claim that he was the UN’s disaster mitigation expert were proven to be false. 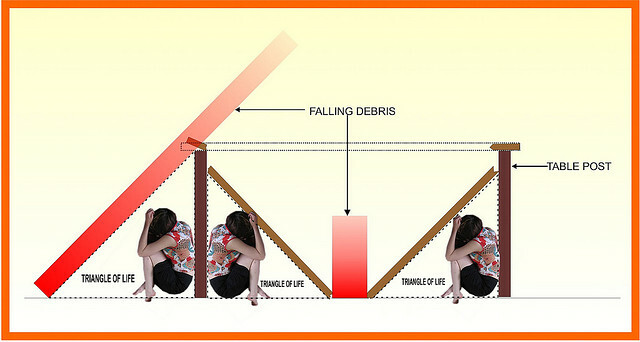 As an experienced rescue worker who actually has extricated people from collapsed buildings, I can tell you the Triangle of Life theory is both unfounded and dangerous based mainly on the fact you cannot predict the nature of how a building will collapse. Thanks Ryan. In spending a little time viewing on a friend’s television the latest Christchurch quake, it would seem to be very difficult to predict the way a building would collapse. Thanks for your inside perspective. You said that you leave it up to people to decide and that you don’t want to judge anyone, but don’t you think that if something is potentially misleading, it might not be good to disseminate it?